This is amusing to me in several ways. ^Links to Live Diamond Goods page. Personally, I think they had better goods for Live Formula and Live Fighter. XP The jersey/uniform and cap are cool though. HAHAHA. Nana-san still has yet to tell her mother that Smile-Gang is being broadcasted in Ehime-ken. XDDD But something tells me that her mother already knows… She’s the head of a Nana fanclub in Ehime, one of the members must have told her! XDDD Unless everyone is obedient and loyal and believes no one should tell her except of Nana-san herself. Nana-san: But mama, that’s how the song is… And I am 29. Mama: Nana-chan should still be giving off the cute image, why did it turn into that? We all know about the Ultimate Diamond Truck, yes? We also know about the Diamond Express (train), yes? 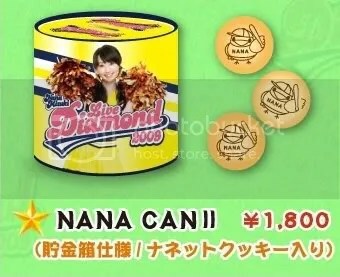 Nana-san just updated her blog not too long ago with regards to ULTIMATE DIAMOND achieving the number 1 rank on Oricon Weekly Chart. I thought I’d do a translation of it since it’s special and really shows how Nana-san is currently feeling. It’s a rather long blog post so I’ve put it under cut. Sorry for the double posting but this really deserves its own post. MIZUKI NANA – ULTIMATE DIAMOND NUMBER 1 ON ORICON WEEKLY CHART!!! CONGRATULATIONS TO NANA-SAN!!! It’s an unprecedented achievement!!!!! ^Ok, so I’m sure most have heard about that already but I feel obligated to post about it anyway. On another note, KING RECORDS is currently in the process of accepting Ultimate Diamond booklet exchanges. There were lyrics error on the booklet for PERFECT SMILE and ray of change. Admittedly, I only noticed the error for PERFECT SMILE because it was really obvious (and I’ve had most of the lyrics memorized for that song before I received the CD) XD. There will be a MIZUKI NANA TRAIN that takes passengers straight to Seibu Dome for the concert next month!!!!!!!!!!!!!!!!!!! \(^o^)/ DIAMOND EXPRESS! Awesome trailer truck is awesome. It’s so bright. XDDD And HUGE.